Quite a few of my regular clients gift sessions and treatments for friends and family. 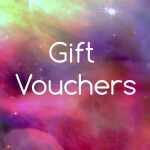 You can gift these printed gift vouchers instead in £10 denominations and let them decide what they wish to spend them on! Vouchers have a one calendar year expiry date from date of purchase.